The day after Dandelion had gone it was so sad to see Cinnamon spending time alone in the small shelter where they had spent a lot of their time together. It was if she thought Dandelion might suddenly appear in here. She spends some time alone in here every day. 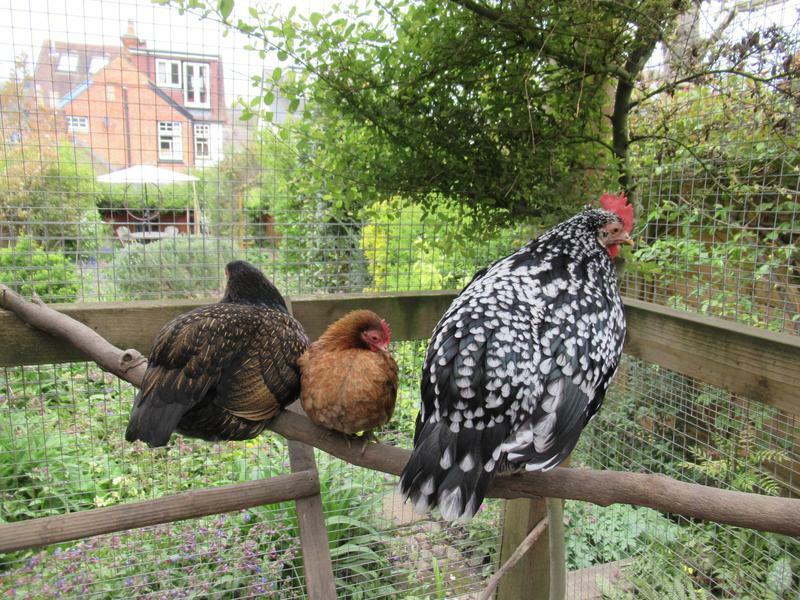 Cinnamon has taken to sticking very close to Speckles and to hanging out with the bigger girls. 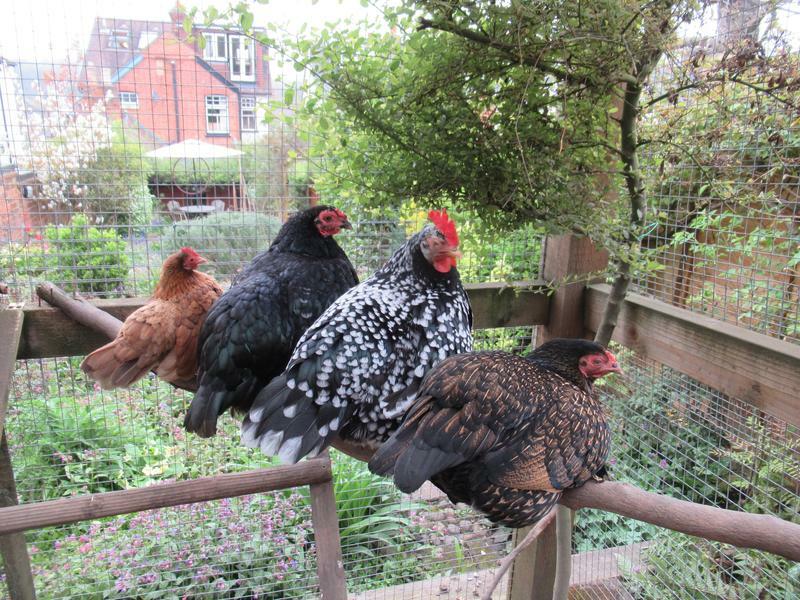 The flock seems to have formed two groups, Cinnamon and the bigger girls and the amigos and the silky girls. I am glad Cinnamon has the bigger girls to hang out with. It’s so sad to see her without Dandelion. As this is the first year of having an allotment we are on a learning curve. We were all very eager to get everything started and now realise that we sowed our runner beans and dwarf beans a bit too early. They can’t be planted outside until there are no more frosts and we are getting frosts every morning at the moment. We are still hardening the beans off by putting them outside during the day and bringing them in at night. What we now realised was that they were out growing their pots and the roots were coming through the bottom of the pots. If we didn’t transplant them we wouldn’t be able to get them out of the pots without damaging the roots and we want to keep the pots intact to reuse next year. 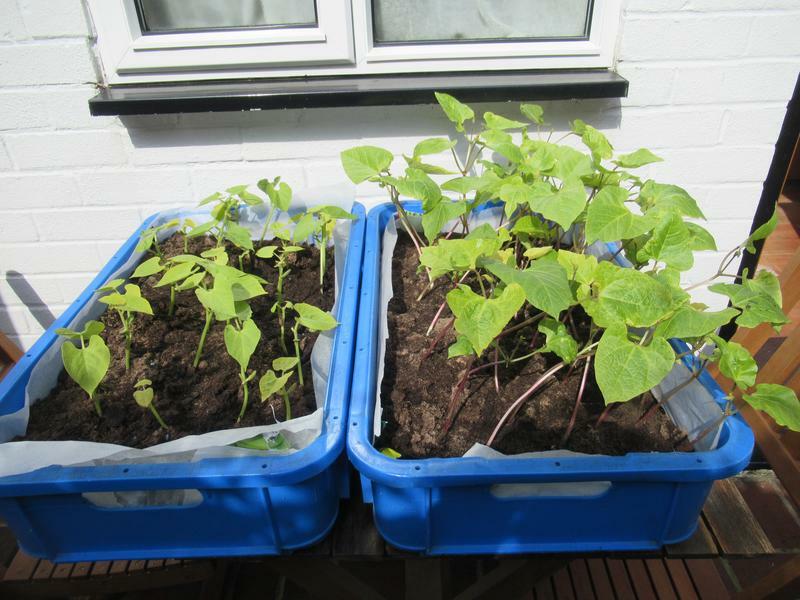 We decided to move them on to grow bags which we cut down to fit our plastic crates. 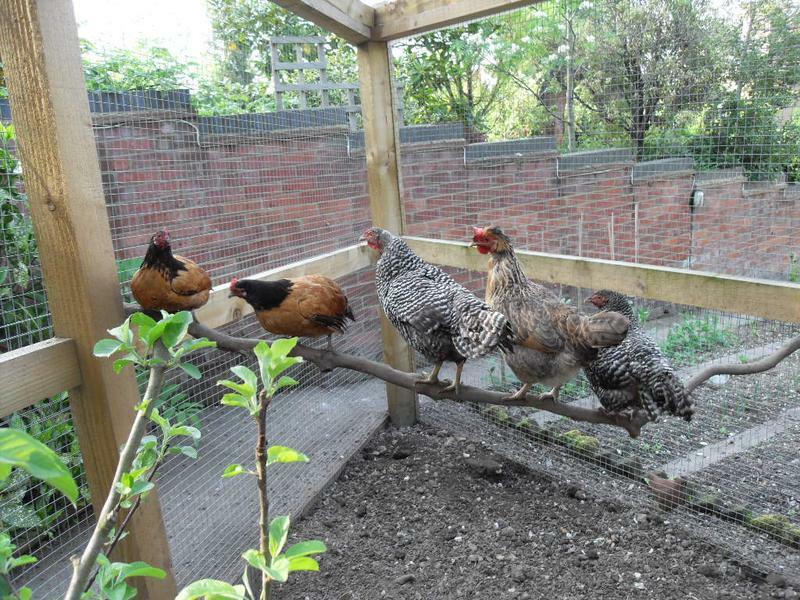 This will make them easier to transport to the allotment when we are ready to plant them. We have planted the broad beans on the left into the allotment plot because broad beans can withstand frost. 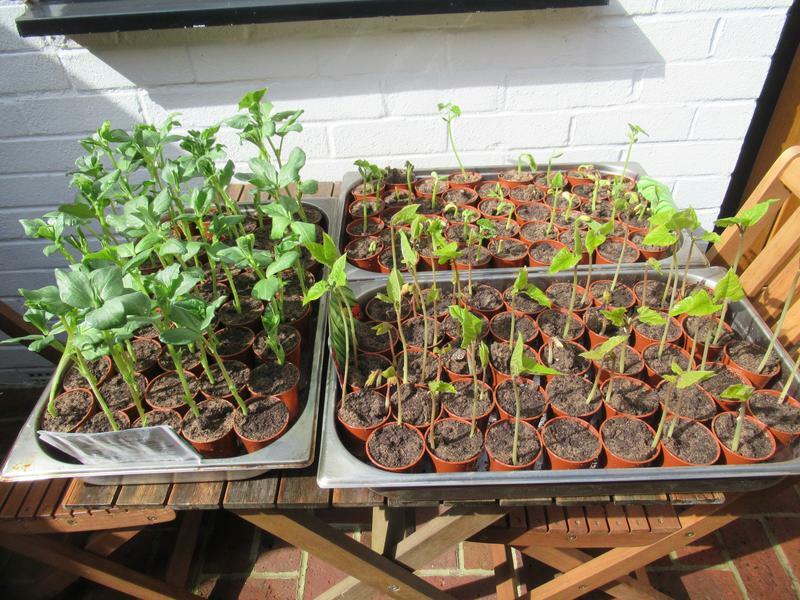 The beans on the right have trebled in size and we have now transplanted them. This has been our first lesson learned. Next year we will sow our beans at any time between now and the end of April. This means they will be able to go straight from the pots to the allotment in May without us having to do this middle stage. We hadn’t realised how quickly they would grow and during a recent chat with my mum she said that she will be setting her beans over the next week or so. Never mind, I am sure we have a lot more to learn yet. 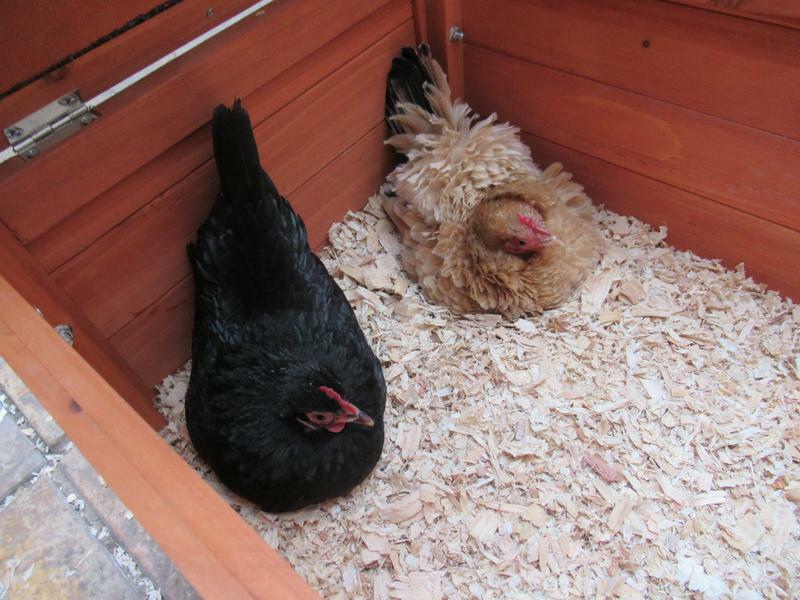 A few days after the first post I did about Ebony and Vanilla sitting in the corner of the chicken shed they settled in there together again. I removed Ebony’s egg and a few minutes later Vanilla laid her egg. Two days later they were settled together again. 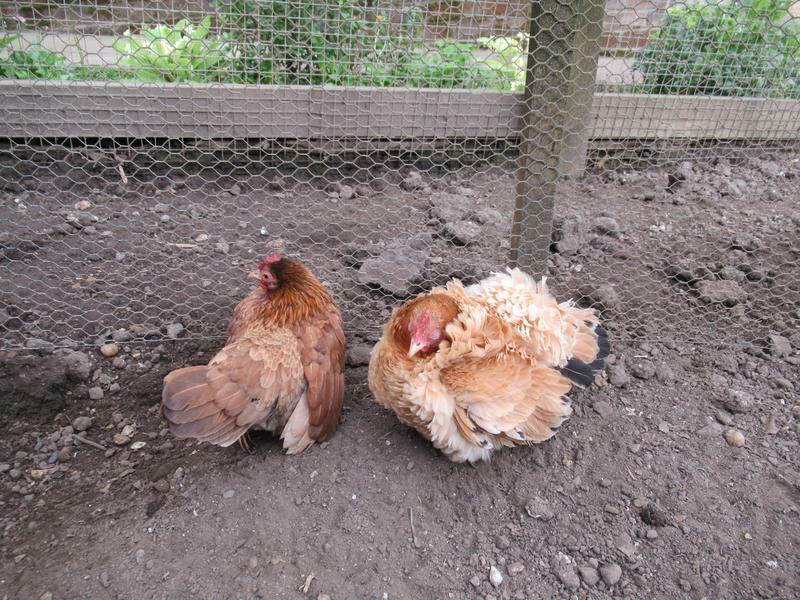 These two seem to be perfectly in sync with their egg laying. 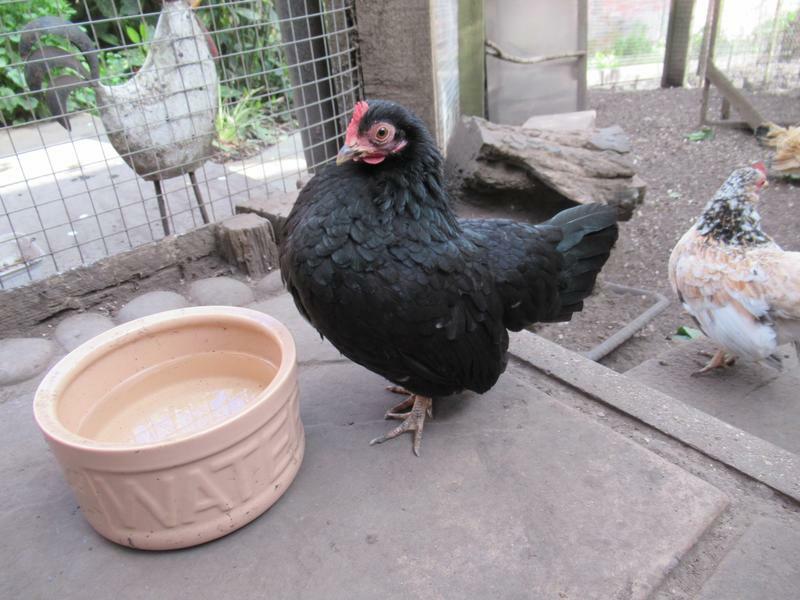 When I checked back a little later Ebony and Vanilla’s eggs were together in the corner. I can’t believe how in tune these two are at the moment. This was also our first, seven egg day, of the year. 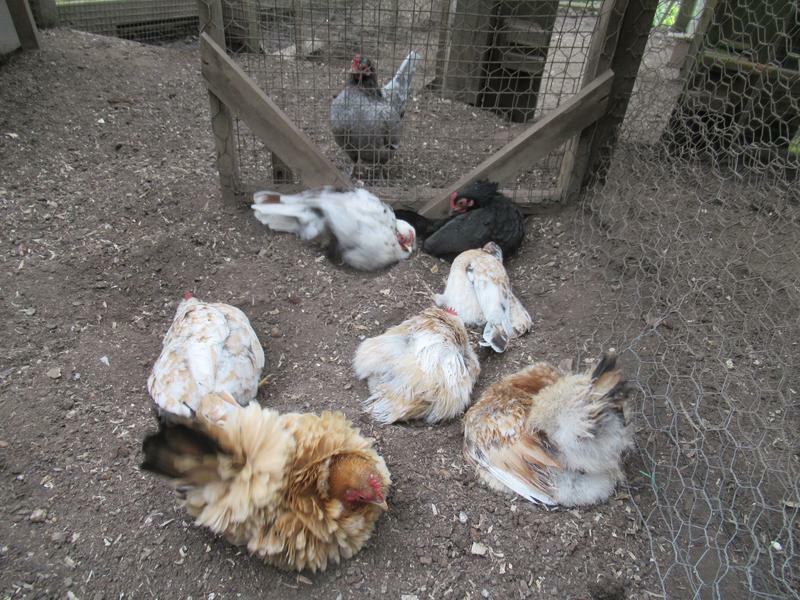 We had eggs from Ebony, Vanilla, Jasmine, Flame, Smoke, Spangle and Salmon. Dandelion looked so lovely yesterday so it was a shock to see her looking really poorly today. She was sitting in the run with her eyes closed and her chest was bobbing up and down with her breathing. Cinnamon was sitting with her keeping her company. After all the wrangling over the last few days about Dandelion’s future she has now made the decision for me. I think she was having an egg related problem. 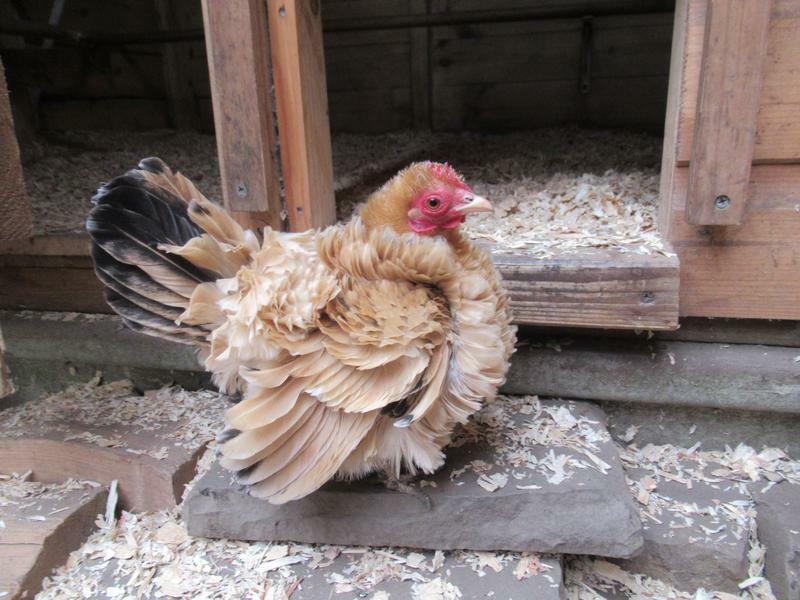 Dandelion had laid eight eggs, laying every other day and was due to lay today. I don’t understand why she was having a problem because her eggs were tiny and had good shells but I have seen this with her enough times in the past to know that she was now having a problem. If I had to have her put to sleep then I would rather do it while she was looking poorly like today than while looking great like yesterday. Fate seems to have intervened and made the decision for me. I rang the vet and booked an appointment as early as they could fit me in. By the time it was our turn to be seen Dandelion was looking more stressed than I had ever seen her. Her breathing was rapid and her beak was open. The vet was a different one to the one who had called me and who wasn’t back in until Monday. This vet was really kind and agreed that she thought it was egg related. She asked if I wanted to be present while Dandelion was put to sleep as not everyone does but I said that I would rather stay with her. The vet got another vet to assist her. The other vet held her while the first vet found a vein under her wing to inject her. They were both so gentle and kind and I talked to Dandelion to try to sooth her. It was very quick and gentle and I stroked her and cried over her but I knew this was the kindest thing for her. We have always said that Dandelion was the chicken with nine lives. We have been lucky to have her for three years. 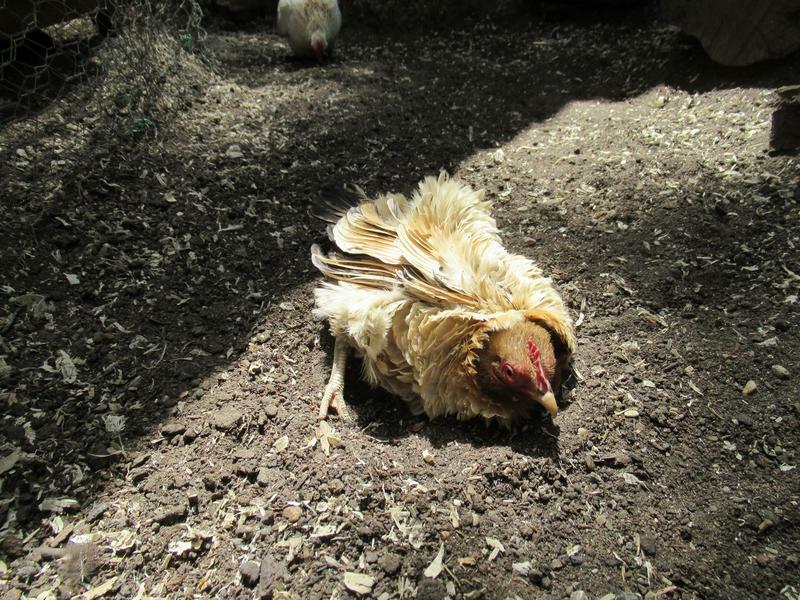 In her first summer she came back from laying soft shelled eggs, she has come back from myco during two winters and last summer was the only girl to come back from a prolapse. Dandelion was a fighter. We are so sad to lose her and I feel for poor Cinnamon who will be lost without her. 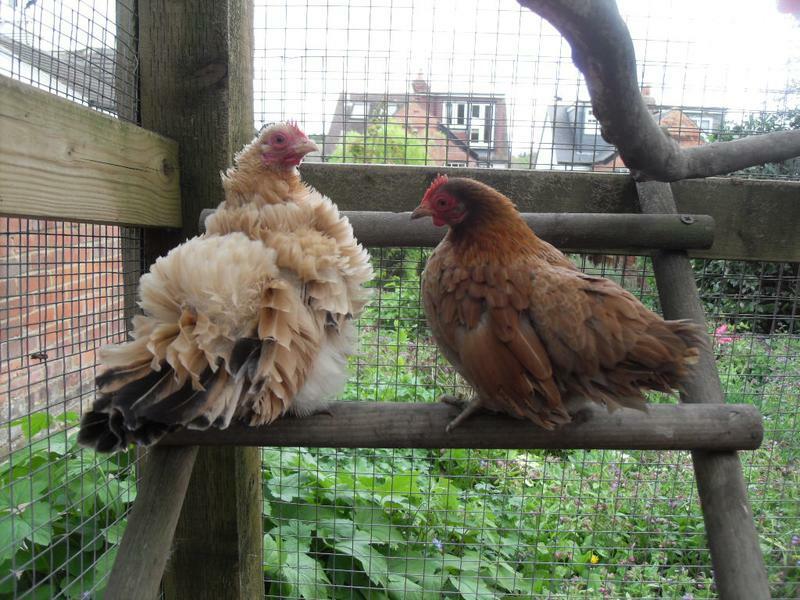 They were such a tight little pair from the moment they came into the flock. Cinnamon has been standing alone at the spot where they both were in the photos above. I will be doing a tribute to Dandelion soon but at the moment I am too upset to say anything more. 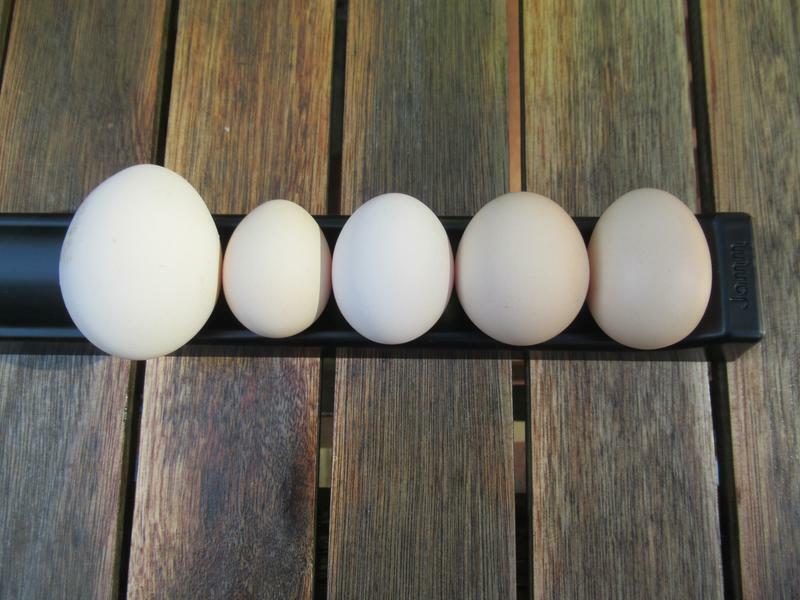 Vanilla’s, fair sized, beige, eggs are laid in the corner of the chicken shed and I often find them next to Flame’s or Ebony’s eggs. 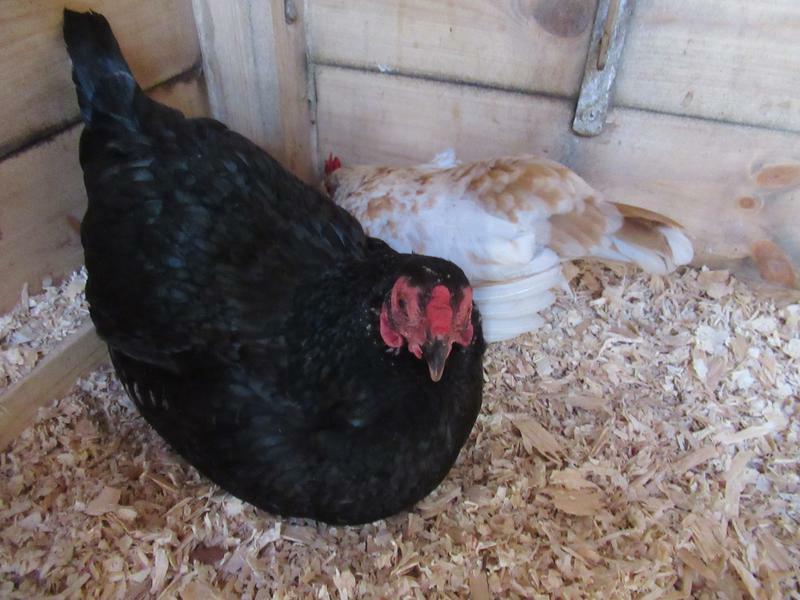 Yesterday Ebony was in the corner of the chicken shed and Vanilla was also in the shed being very vocal. 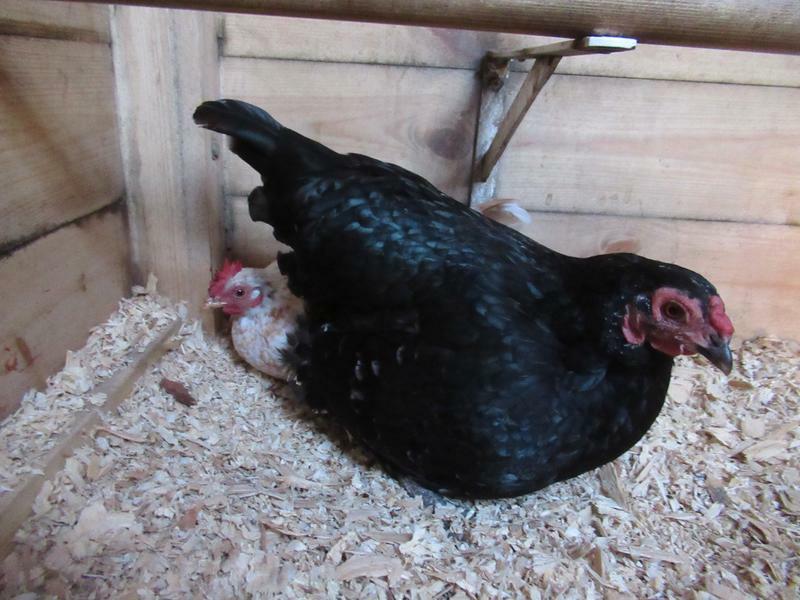 I wondered if Ebony was sitting on Vanilla’s egg but Vanilla kept getting closer and closer to Ebony. The next time I checked in on them Vanilla had managed to squeeze into the corner of the shed behind Ebony. A bit later Ebony was out in the run and when I checked her egg was in front of vanilla who was moving it around with her beak. 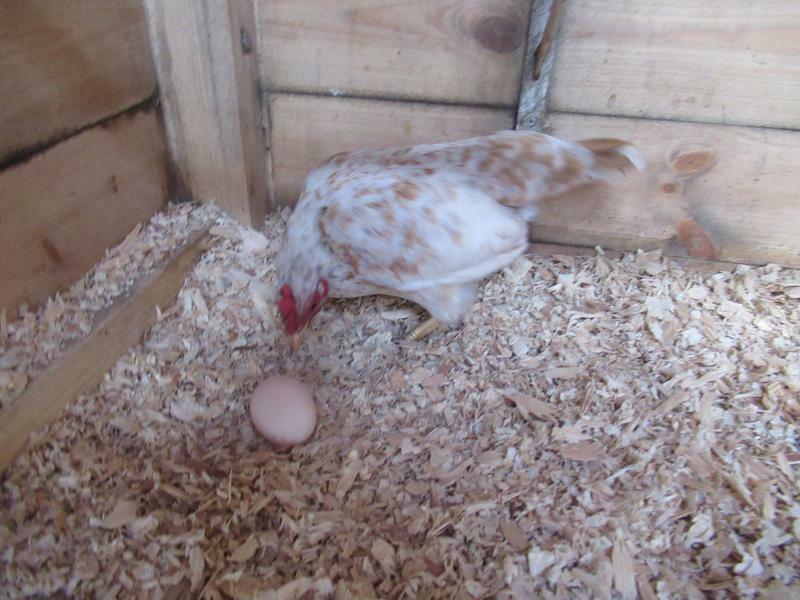 I removed it and when I checked back again Vanilla was out in the run and her egg was in the corner of the shed. It is definitely proof that in our flock there is no problem at all with bigger girls and little girls being happy alongside each other. It is heartwarming to see this. I had a feeling that Marmite’s broodiness was weakening. Yesterday morning she was out in the run, when I went in first thing, rather than me lifting her from the nest box for the morning sunflower seeds. She returned to the nest box but she stayed out in the afternoon for a communal dust bath just like the day before on my previous post. This morning she was again out in the run when I went in first thing. I checked back an hour later and she was still out, hurrah! Marmite stayed out all day. After exactly a week she has come out of it. For the last few days Smoke has been looking as if she was getting ready to lay again. She has been going to the grit and checking out the nest boxes. Late this morning Smoke settled in the nest box. 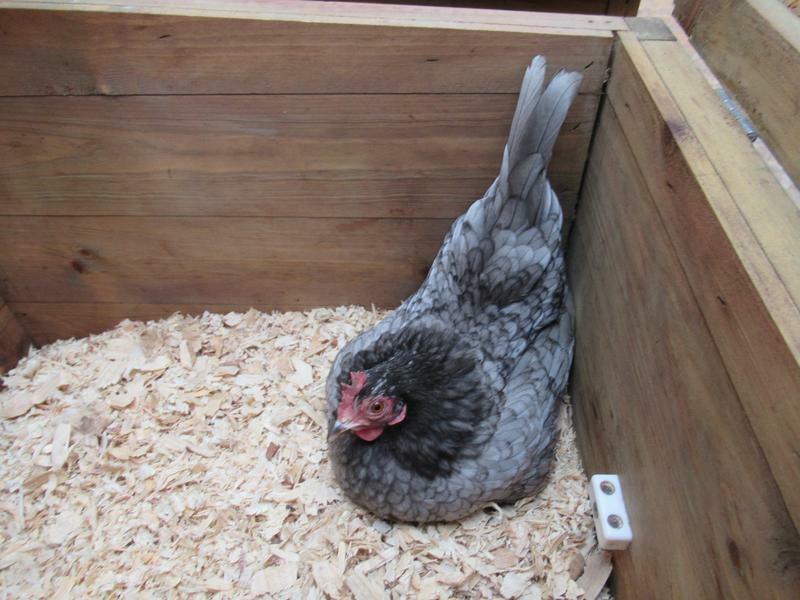 When I next checked on her she had laid an egg after a two week break. Then to my surprise this afternoon Jasmine was in the nest box. A few minutes later she laid her egg in front of me with no time to get a photo of her. Jasmine has only taken a one week break from laying. 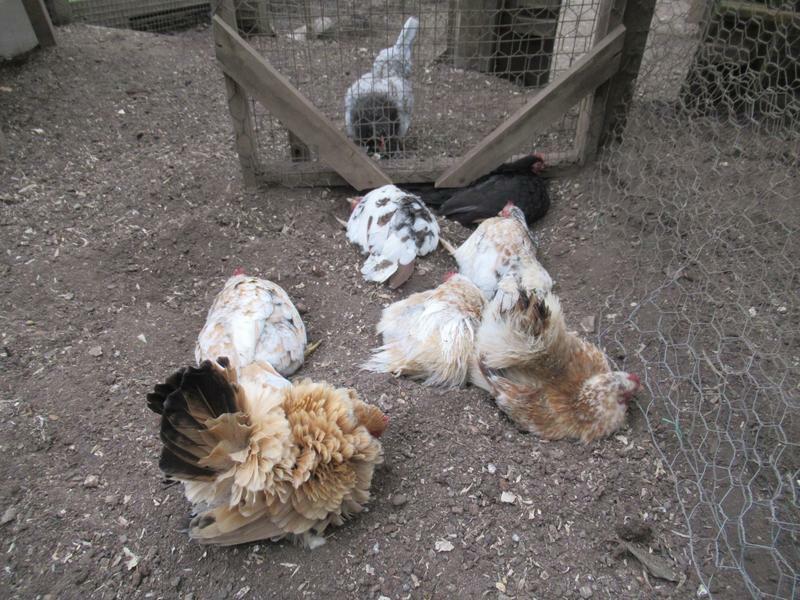 As I have found before the shorter time they are broody, the quicker they come back into lay. 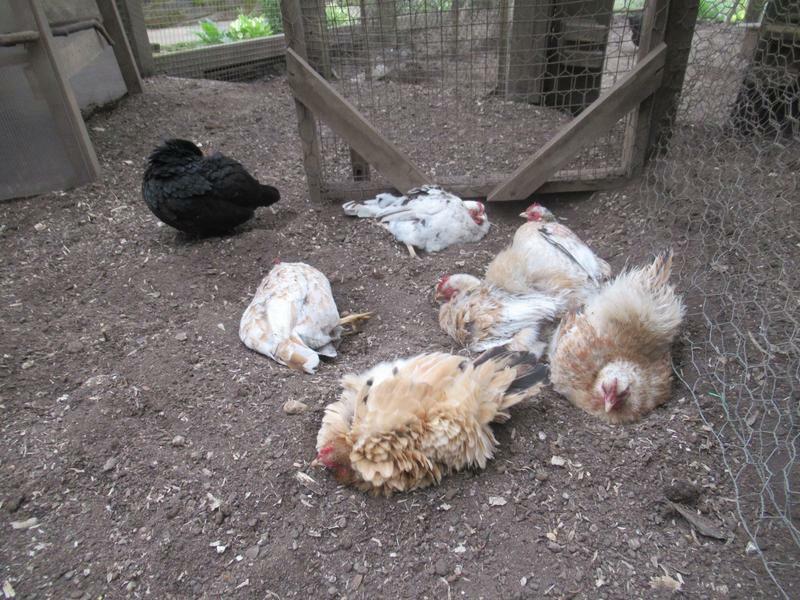 I am surprised that I am still able to tell which girls are laying, at the moment, for my egg record. There are several reasons for this. 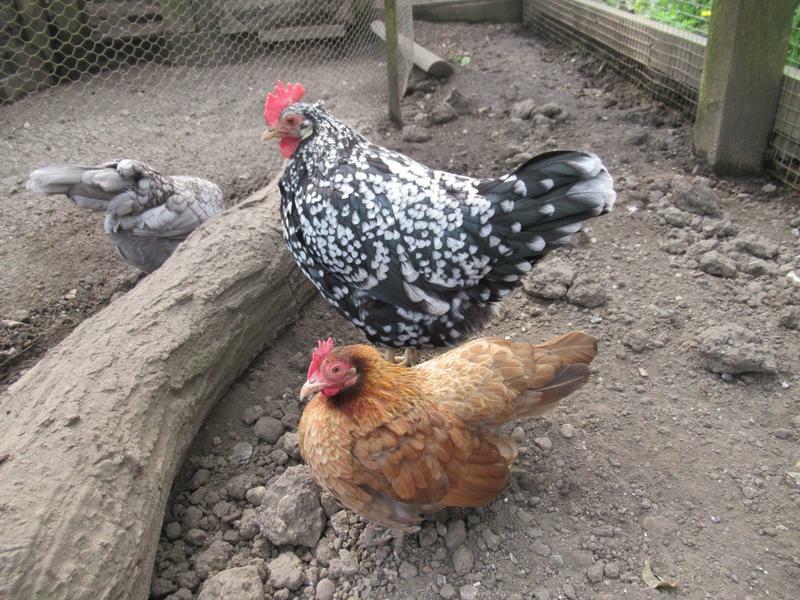 Speckles has given up after one egg and Ebony has beige eggs and Flame has white eggs so the bigger girls are a doddle. 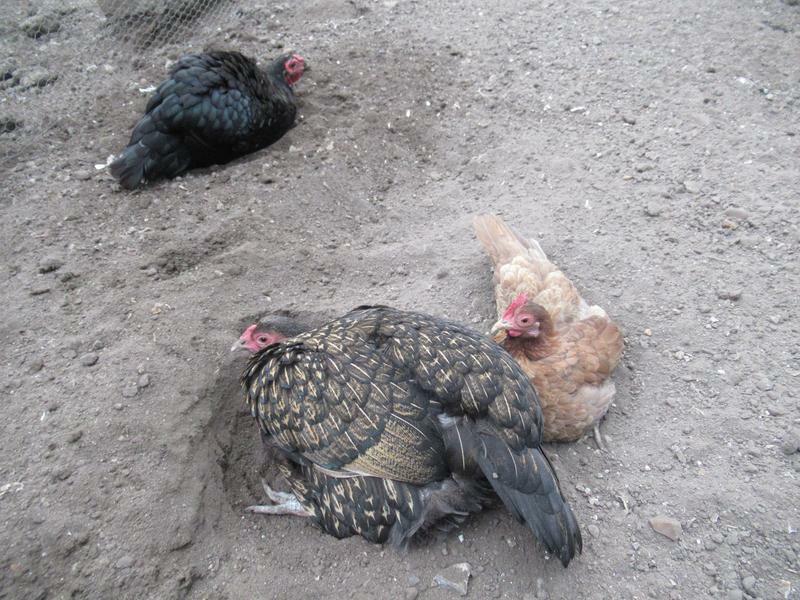 Of the smaller girls there are usually three on a broody break at any given time so that narrows it down. Sienna, like Salmon before her, hasn’t really got going properly yet. 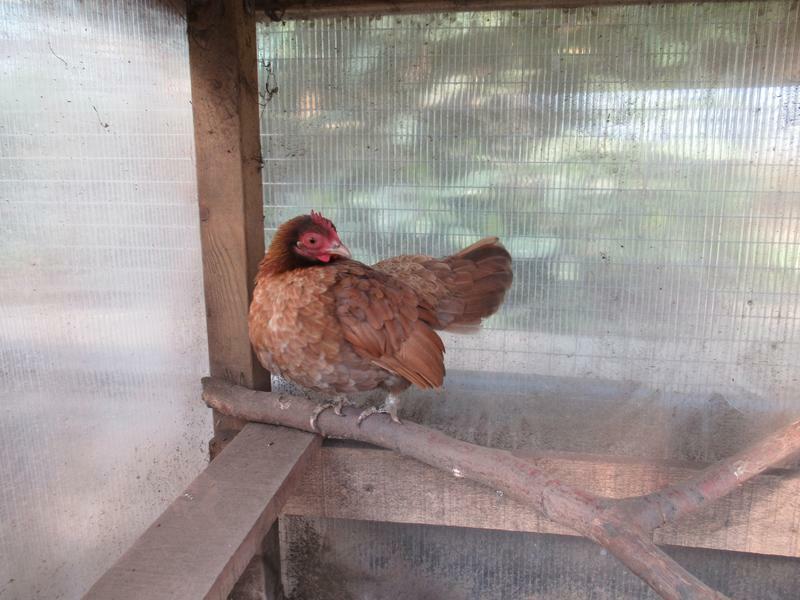 Cinnamon has only laid one egg so far this year. Dandelion lays tiny eggs, every other day and Smoke and Vanilla lay bigger and rounder eggs but Smokes are white and Vanilla’s are beige. 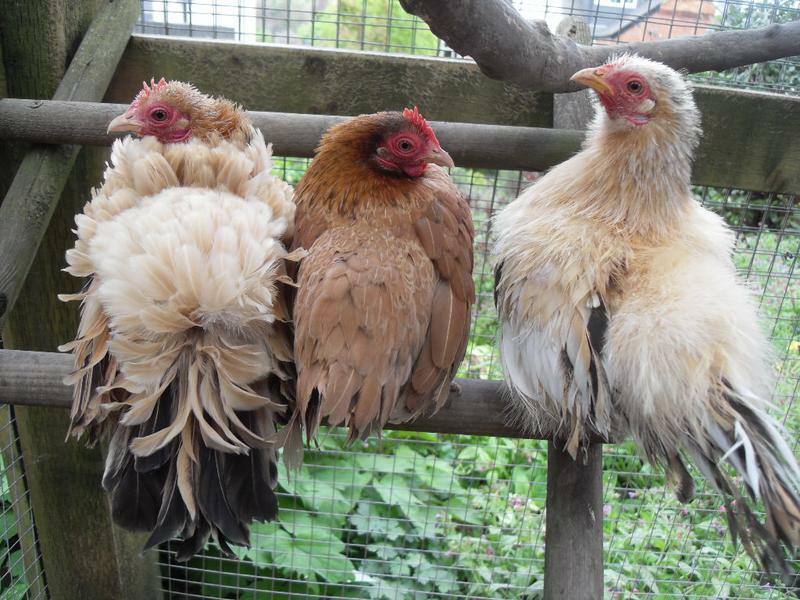 The rest of the girls lay longer, beige, eggs but lay every other day so are fairly easy to predict. I am also here a lot of the time so I can usually catch them missing on parade and they tend to be quite vocal before hand. 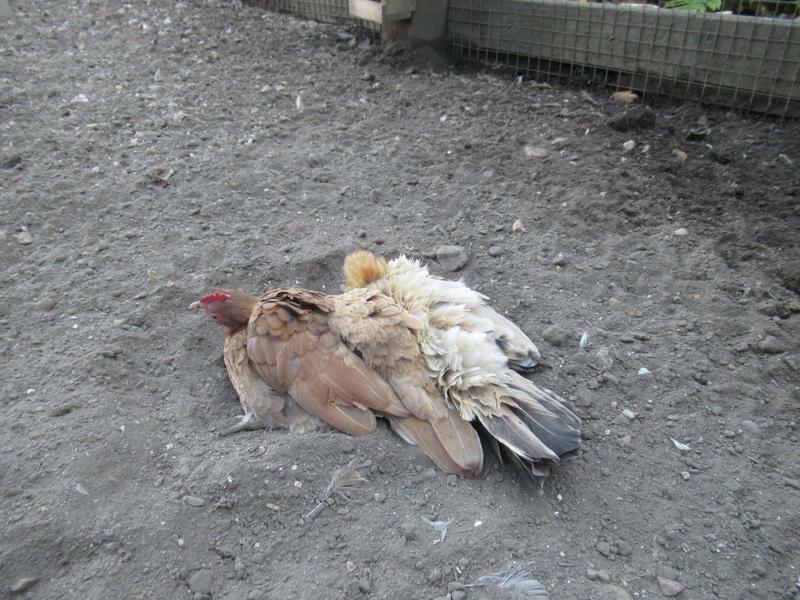 Even when we are out like Sunday when we were at the allotment for five hours I can predict who will probably lay. Ebony lays every other day so I knew she was due to lay and Vanilla was being very vocal and in and out of the chicken shed before we left. Salmon and Spangle also lay every other day and on the same day so I predicted they would lay too. 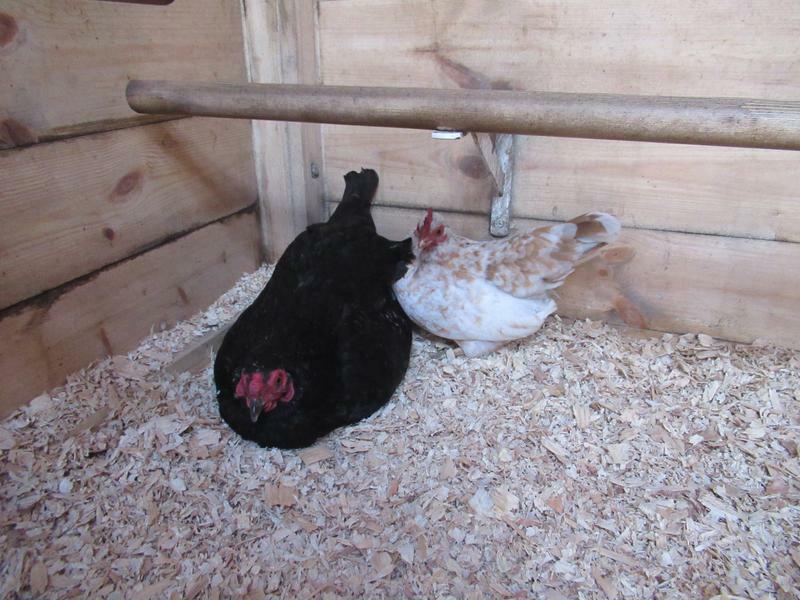 On our return Ebony’s and Vanilla’s biggish, round, beige egg, were together in the corner of the chicken shed. 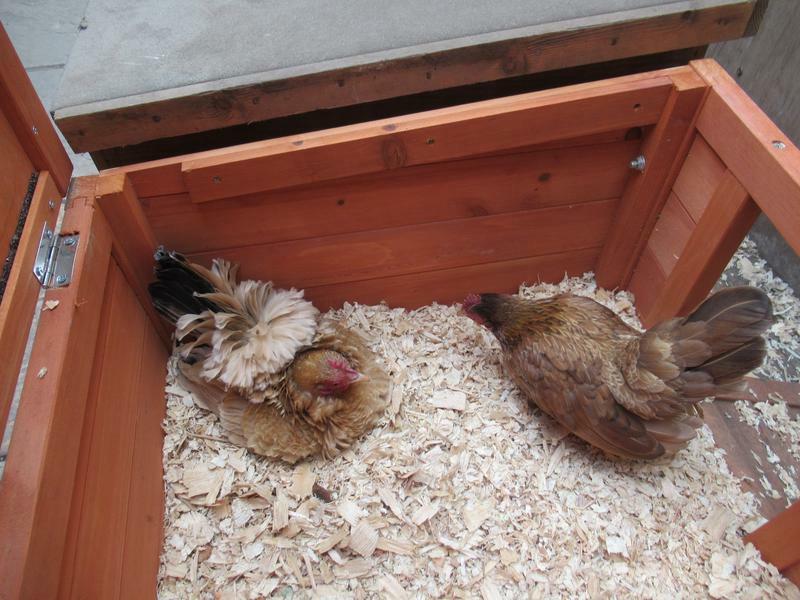 Salmon and Spangle’s eggs were in the nest box. 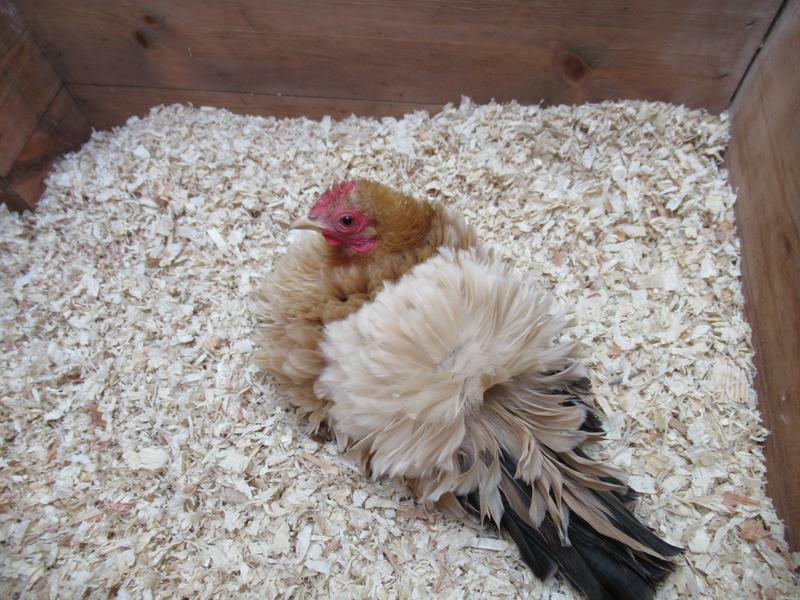 It also helps me predict because most of the girls have a favourite place to lay their eggs. To demonstrate this Flame’s egg is on the left to give scale. Next is Dandelion’s tiny egg. Next is Smoke’s round, white egg. As it is her first one back in lay it’s not quite as big as usual. It would usually be the same size as Vanilla’s egg, which is next and is round and beige. 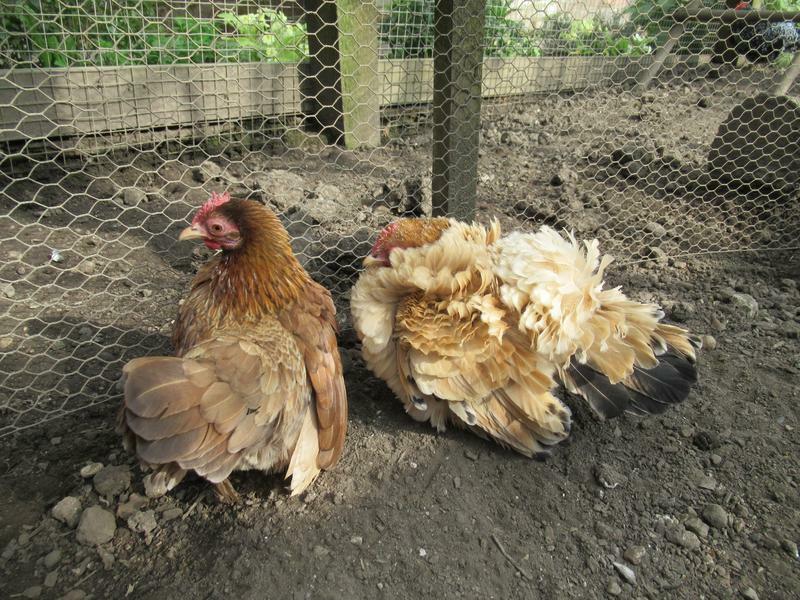 On the right is Spangles egg which is beige and a longer shape. It is fun being able to tell who is laying but I expect there will be times in the summer when we are out all day and it may not always be possible. It is good to have Smoke, our best layer, back in lay again and no broodies for the moment!